This is the same water lily tutorial that has been linked from my blog for months; but, it was originally published on the Sixth&Elm blog as a guest tutorial and she is revamping things over there and I think my tutorial may have been lost in the shuffle. Since it is Part 1 of the Water Lily Book Tutorial, I just wanted to revive it here if anybody is looking for it. Start with a square piece of paper. Thin lightweight paper is best. Doesn't matter how big, as long as it is perfectly square. The paper I'm using in the photos is 6" square. 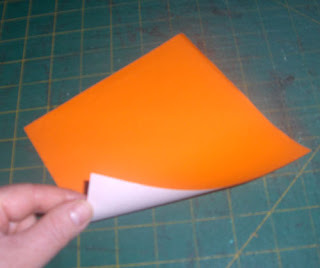 This paper is also two different colours, white on one side and orange on the other. That makes the finished water lily a little more interesting than a single plain colour. But it doesn't matter really. So, put the paper flat on the table in front of you. (I put the white side up because I want the orange to show on the outside of the flower and the white on the inside). Now fold it in half, straight edge to straight edge, make the crease nice and smooth, then open it back up again. Then fold it in half again, the other way, open it up again, then flip it over. Now fold it in half diagonally, just once. Open it up again and turn it back over. 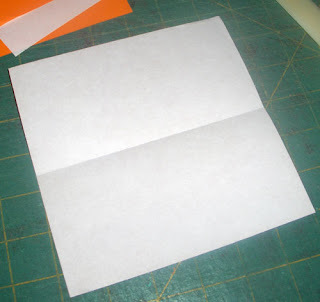 Bring the bisected corners together, push the other corners into the middle, and the paper should fold into a smaller square. 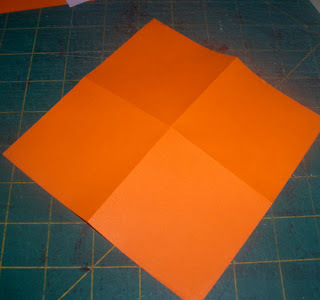 Flatten this square and smooth all the folds to make sharp creases. Place the paper on the table in front of you with the closed corner closest to you. On the right side, lift the top layer of the paper and fold it into the middle – bring the point in to the centre of the square, then smooth the fold. Repeat on the other side. Flip the whole thing over, and repeat those folds on the other side. 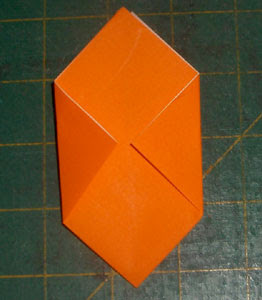 Open one of the folded corners and push the tip in towards the centre to change the direction of the fold – from a mountain fold to a valley fold. Flatten this fold and smooth the creases. Repeat on the other side. Flip it over and do the same thing on the other side so all four points will be tucked inside. Open it up a bit, and there is your lily, yay! Now you can make a whole bunch of lilies. I made 5. Then I stuck them all together back-to-back with double-sided tape. Now it will open up, into a big crazy star!! Now that you know how to make an origami water lily, you can proceed to Part 2 of this tutorial and use your water lilies to make a book. Thanks Rhonda, I searched all over for this last week so I'm very pleased you've put it up again. I love the effect of this little book. Oh I forgot about this book tutorial- I have some collage papers I want to do something with so this book would be perfect. Hello! I just came from the Folding Trees web site and I was so excited to try this tiny book, that I made it right away! It is adorable! Wow! Thank you for the water lily tutorial! I hope mine turn out to look as pretty as yours! The idea of putting them all together to make a book is fabulous! You are very creative!